Inlanta is please to announce our President, Nicholas DelTorto, was elected to the National Mortgage Bankers Association (MBA) Residential Board of Governors (RESBOG).With this appointment, DelTorto becomes the first member of the Wisconsin Mortgage Bankers Association (WMBA) to be elected to the RESBOG. The Mortgage Bankers Association is governed by a Board of Directors containing 26 people who are responsible for the overall management of the organization’s affairs. RESBOG handles the residential interests of MBA members, while the Commercial Real Estate/Multifamily Board of Governors (COMBOG) handles commercial interests. DelTorto will help carry out the MBA’s mission to establish an environment that enables members to achieve their personal business objectives and come together as a community to act as a voice for important regulatory and legislative issues affecting the industry. The organization seeks to represent all segments of the real estate finance industry and all types of stakeholders, including small town members to major Wall Street players. 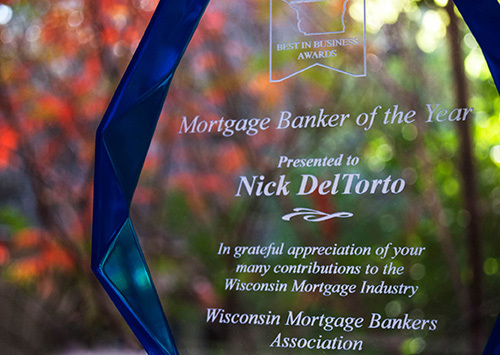 DelTorto was also recently presented with the Mortgage Banker of the Year award from the WMBA, a tremendous honor. This award, along with appointment to the board, is a testament to the quality of leadership he brings to the table with Inlanta. Our mission is to be a trusted home financing partner; having a company president who is a highly recognized, esteemed mortgage banker and a member of an influential industry governing body, such as the RESBOG, is another reason clients can feel good about placing their faith in Inlanta. Inlanta is the second largest mortgage financing provider in greater Milwaukee as ranked by the Milwaukee Business Journal. Inlanta has also been recognized as the #1 FHA, USDA and WHEDA lender in the state of Wisconsin. Locate an Inlanta Mortgage loan officer at http://www.inlanta.com/locations. Learn more about Inlanta Mortgage branch partnership opportunities or third-party origination solutions at http://www.inlantapartners.com, call 262-439-4260 or email partners@inlanta.com. Pictured above, left to right, are: John Watry, Chief Financial Officer, Inlanta Mortgage; John Knowlton, Chief Executive Officer, Inlanta Mortgage; Peter Bildsten, DFI Secretary; Georgia Maxwell, DFI Executive Assistant; and Nicholas DelTorto, President, Inlanta Mortgage. Inlanta Mortgage is pleased to announce its President Nicholas DelTorto was installed as the president of the Wisconsin Mortgage Bankers Association (WMBA) on Friday, June 14. The new officers and board of directors, along with general membership and guests, attended an installation breakfast and meeting at Country Springs Hotel in Pewaukee, with several Inlanta employees attending to support DelTorto. 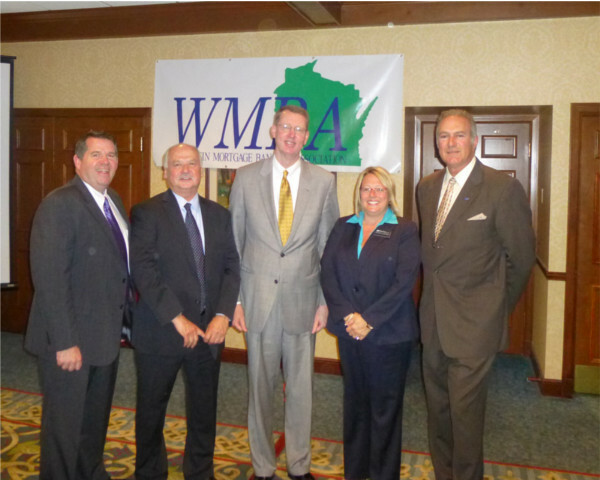 The guest speaker was Secretary Peter Bildsten of the Wisconsin Department of Financial Institutions (DFI). Secretary Bildsten spoke on a variety of topics relevant to the mortgage industry, including how well the housing market is doing in Wisconsin and the high quality of mortgage originations in Wisconsin compared to those of the nation. He also touched on regulation and licensing updates, including how the DFI is working with the Consumer Financial Protection Bureau on consumer complaints and audits. Along with DelTorto, John Inzeo was installed as secretary/treasurer and Marcia Howe was installed as president-elect for the 2013-2014 term. Inlanta Mortgage is a multi-state mortgage banker based out of Brookfield, Wisconsin. NMLS #1016.